To say that Adam Nestor got out of the blocks in his bike building career like Usain Bolt going for Olympic Gold is an understatement. 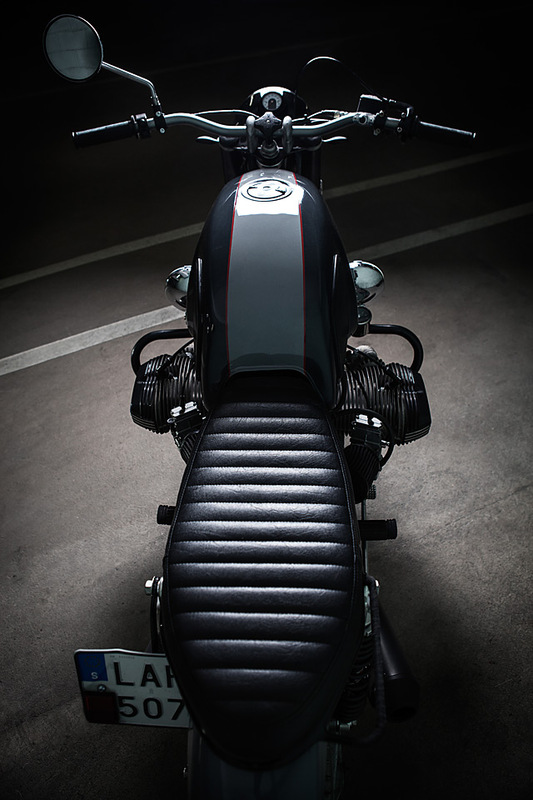 With Adam’s Custom Shop’s first builds including Madame Guzzi and Sporganic this young Swedish bike builder showed at just 20 years of age he was capable of building the sort of bikes most mere mortals require decades of honing their craft to achieve. 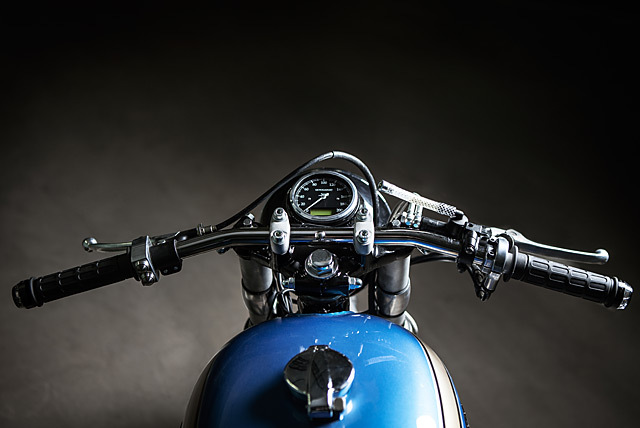 But for a custom motorcycle workshop to survive financially in the long-term a builder has to be capable of turning out lower cost builds while still retaining their signature quality and style. 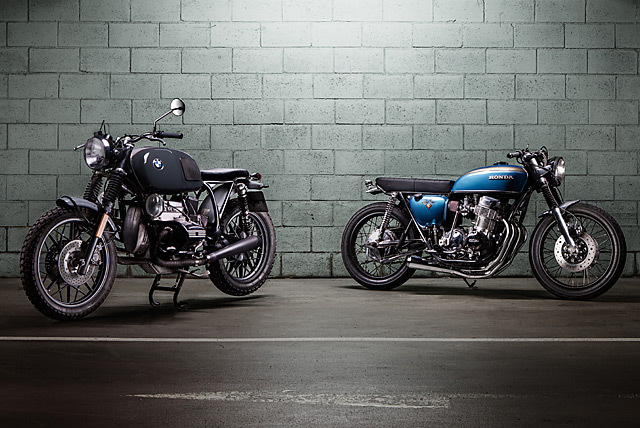 In these two customer builds, a 1974 Honda CB750 and a BMW R100RT the young Swede proves even his budget builds are brilliant! 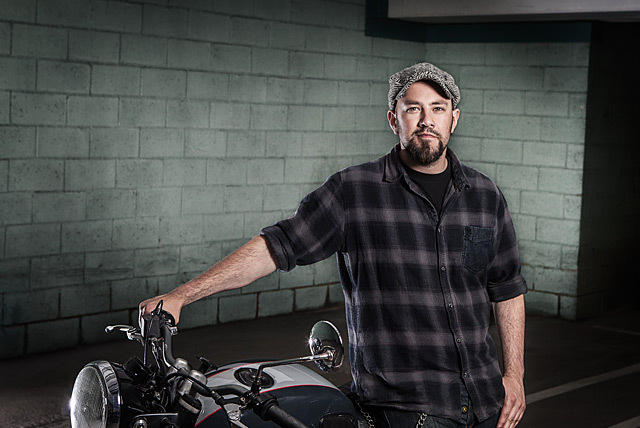 From design, fabrication and paint to the full range of skills to overhaul and customise the mechanicals of a motorcycle Adam can do it all but he also has a well-rounded understanding of motorcycle history for such a young man. 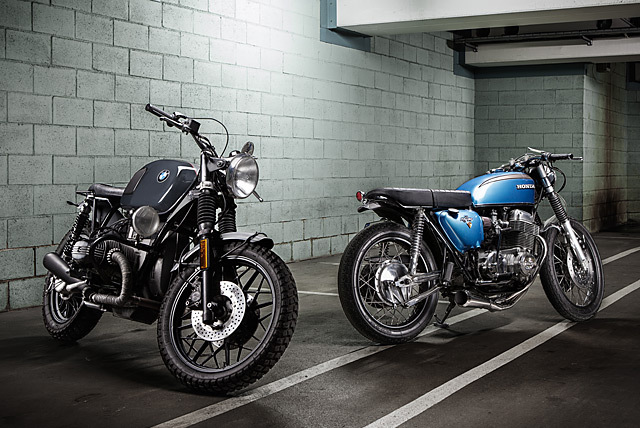 These two models may now be dominant mainstays of the custom bike scene but there was a time when as new bikes gracing the floors of motor shows the world over the hottest examples of each was the concept bikes the manufacturers presented to impress the crowds. 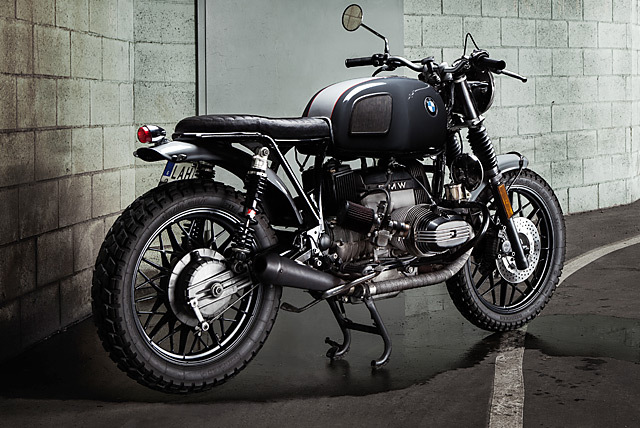 This is a trend that continues to this day, factory concepts that while not over the top, give prospective buyers and the aftermarket an idea of just what can be done with some clever customisation. With that in mind Adam has given his customers the sort of factory quality modified machines many a show attendee and those with a media pass alike lusted after in the back in the day. 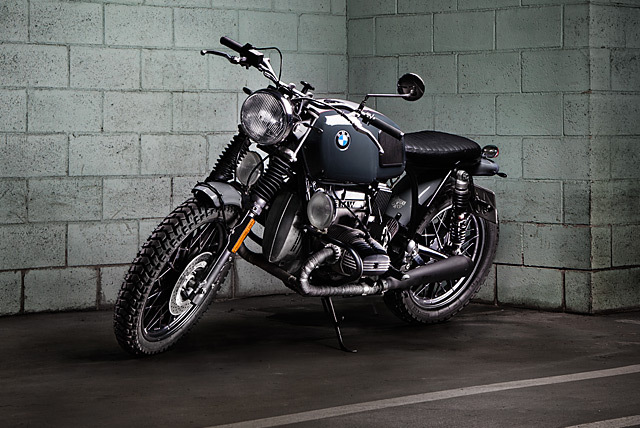 The BMW R models are the hot ticket right now in the custom world and Adam wanted to give his customer a concept style bike like the Scrambler concept BMW presented in the ’70s. Starting with an R100RT means a lot of dead weight has to be removed first to take advantage of the more powerful lump and even stripped down she’s not a thing of beauty. The real issue remains the rear subframe and Adam set to work crafting a neat rear frame that didn’t look like it was ready to accept panniers and a host of accessories. With a Scrambler look in mind Adam needed to create the sort of mud-stoppers that would have been truly effective in an Enduro event and a pair of Honda Goldwing fenders give him the bulk from which to fashion them. Heavily modified the front unit gets its extra clearance thanks to round bar supports while the rear works with the new subframe. 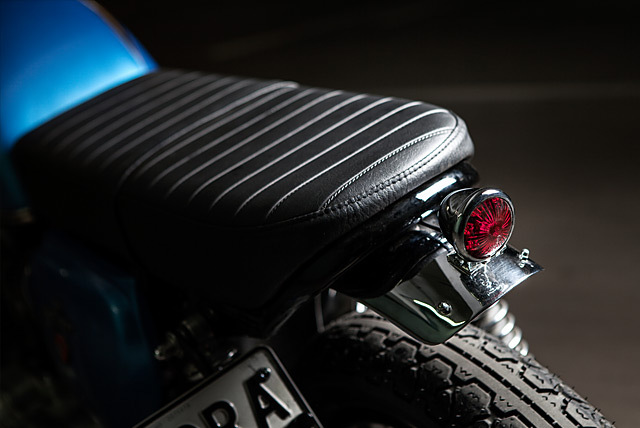 The seat unit itself is Adam’s own, designed to perfectly fit the new look and style of the bike with leather work carried out by his friends at Bullitt Leather in Gothenburg. With seating spot on the steering is done through a pair of Scrambler bars that are fitted out with new Motogadget switches that send a signal to the neat little Kellerman indicators. The stock headlight has been modified to clean up the look and now houses the single instrument, a classic analogue speedo with small digital readout. But that’s not where the lighting ends, this BMW could scramble 24/7 with an extra pair of spot lights mounted to the airhead crash protection bars. At this stage the bike had been given a red paint job with gold stripes, but the more Adam saw the essence of a Scrambler emerge he knew it had to change. So he selected a colour from another Swede, a Volvo graphite gray together with a lighter gray and red stripes for a much tougher, more rugged look. Having started the project with the R100RT model meant his customer was not going to be underpowered with 980cc of Boxer grunt on tap. To unleash a few extra ponies and shed some weight from this torque monster the stock exhaust system has been ditched for wrapped pipes finishing in dual blacked out reverse cone mufflers. But more impressive than the exhaust note is the induction roar from the K&N filter wearing flat-slide Mikuni carbs that now provide the BMW with sharper throttle response and a generous power increase. Helping to improve the already impressive BMW braking is a Brembo master cylinder taken from a Ducati. But given the terrain a Scrambler is required to traverse the standard suspension was going to need an overhaul. Rebuilt gatored front forks do the business up front while the rear is well sorted with a big dollar pair of YSS fully adjustable shocks that keep the Heidenau K60 tyres pinned to the road. 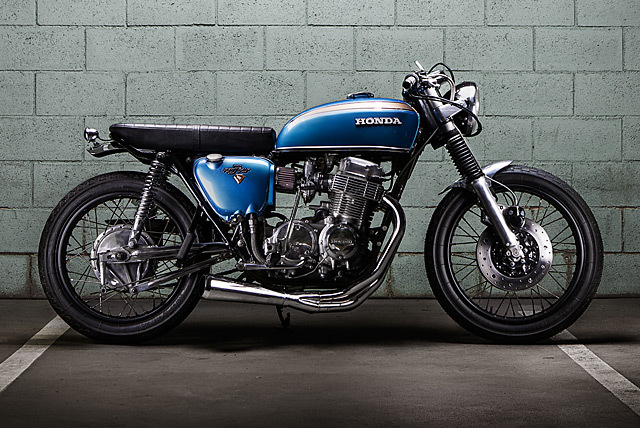 The K2 CB750 is visually a more subtle build, but what it lacks in over the top aesthetics it makes up in spades with the sort of quality a manufacturer would expect if they outsourced a build for a motor show to a custom builder. Adam has once again created the concept feel imagining what an upspec’d CB might have looked like at the time if Honda had offered one. Like the BMW the build got under way with a redesign of the rear subframe. The frame-work is simplified with an up-swept rear hoop that now supports the chassis hugging seat with leather work by One Stop Shop. The simplified look continues with the shortened rear only protruding enough to support the tail light and the beautifully bobbed front fender exposing a great deal more tyre. The factory tins remain in place but Adam has put in a huge effort to ensure they look as good as the day they rolled off the factory floor. With the oil tank, side covers and fuel tank getting a factory paint job off Adam’s gun with perfect decals coming from new old stock. Sticking with the concept theme the suspension came in for the exact sort of overhaul the smart engineers at any major manufacturer make when putting together a special. Raid the parts bin for the best bits you have in-house and a set of front forks from a CB500 provide stiffer dampening and an upgrade to a twin disc front end. The rear brings the same OEM smarts with later model adjustable shocks and the factory swingarm polished to match the rear hub and drum assembly. The 736cc SOHC engine has been rebuilt to factory specs for years of reliable running but like any concept bike there are some performance upgrades. 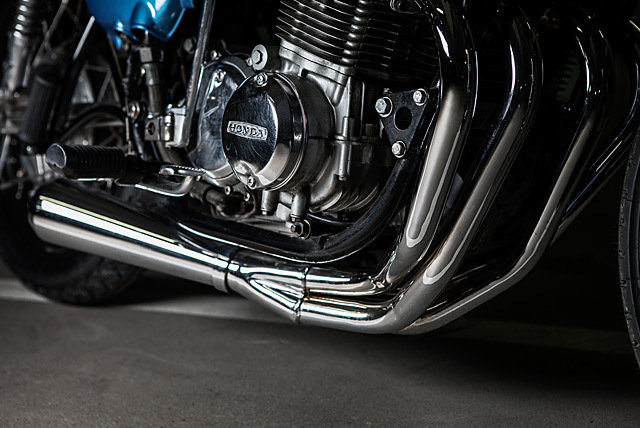 K&N filters give the stock carbs a rorty induction noise, while a stunning set of 4 into 1 stainless steel headers finish out in a single megaphone muffler for some fireworks on the overrun. The business end of things is decidedly cleaner than the factory Honda machine with a set of flat bars and cleverly re-fabricated headlight mounts giving that simplified cafe racer look. Some serious class is added with a single Motogadget switch set that activates the neat bar end indicators from the same manufacturer. While a Motogadget speedo, modern master cylinder and smoothed out top triple clamp mean the CB750 only uses what is absolutely required and nothing more. To finish off the factory concept look a new set of rims have been painted black, respoked with stainless items and wrapped in Heidenau K36 and K44 rubber front and rear. The end result is two bikes that perfectly fit the understated factory concept look, have been built to Adam’s always sky-high standards and most importantly are now ridden by two very happy customers. When this is the level of your basic builds it’s no wonder that there is such a high level of expectation for the next “Special” bike to roll out of Adam’s Custom Shop.